Oh no, I’ve done it again! Despite this supposing to be a blog about baking, the recipe this week is again a non-baking one! Never mind, we all have busy weeks don’t we? 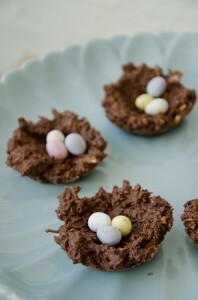 And don’t these little nests look so retro and kitch? I think I must of been about 10 when I last had one but this time I made them grown up with a good proportion of dark chocolate. But don’t feel obliged to get out the expensive 70% plus coco solids chocolate. No, these were made with a cheapish bar of Cadbury’s Bournville with some milk chocolate I had kicking around in the cupboard for added sweetness. So they are frugal and yummy – a smashing combination do you not think? 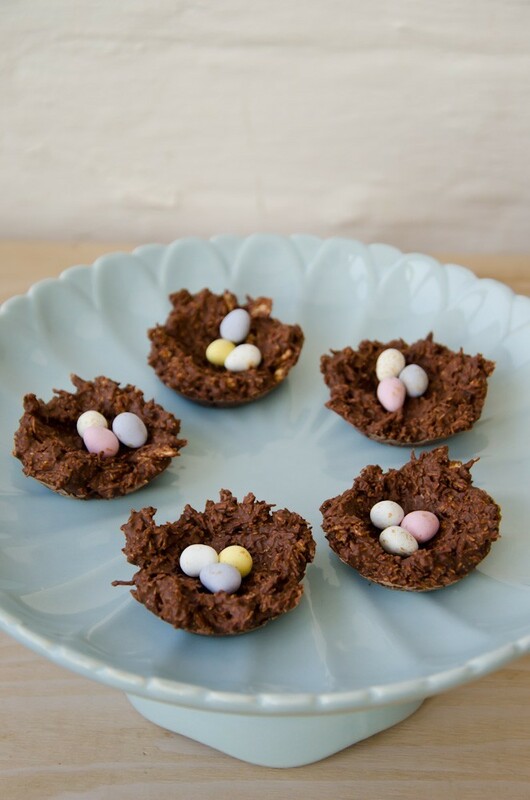 Melt the chocolates and butter in a bain-marie or carefully in the microwave. Crumble the shredded wheat into another bowl. Once the chocolate/butter is melted, stir into the shredded wheat. Divide into 12 among the mince pie holes and gently press the middle of the mound to form a depression to hold the eggs. Put the nests somewhere cold until set then flick them out of the mince pie tin with a knife and add the little eggs. Voila!